The University Library makes available the essential items your students require for their studies. This may be through creating an electronic link or by adding physical items to one of our 2 hour loan collections. The eReserve system provides an automated, user friendly approach for academic and library staff to discover, organise and annotate reading list items. It will streamline the entry, copyright compliance and ongoing maintenance of your reading lists. 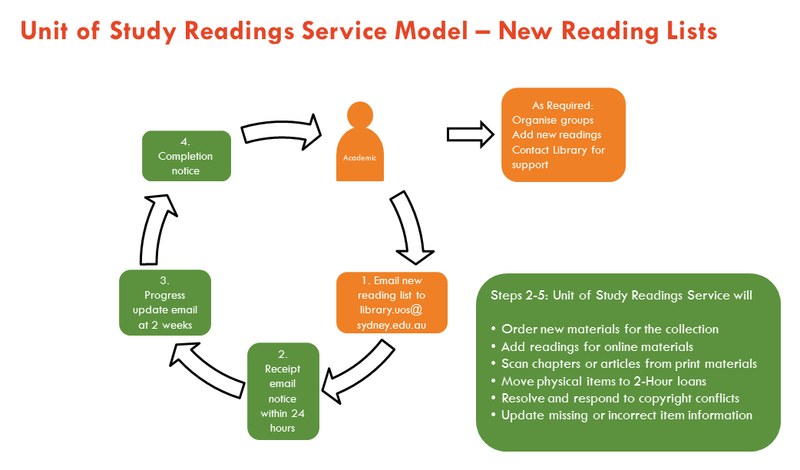 Your reading lists will be conveniently located and accessible within your Unit of Study module/s in Canvas. This means students will find their readings on Canvas. Readings are no longer on the Library catalogue. Show you how the new system works and how to maintain your reading list. If you are interested in learning more please contact your Academic Liaison Librarian. You will receive an e-mail notification from library.uos@sydney.edu.au to remind you to start working on your list for the upcoming semester. Roll over - The eReserve program allows you to copy a previous instance of a reading list, modifying it to reflect the semesters needs, and deploying it. You are also able to add or delete readings plus reorder your list. New Lists - The Library will continue to load your readings. If, however, you would like to speed up the process, you can set up your list and add reading to it. If you need to create a new list, please follow the steps on this guide. You can contact library.uos@sydney.edu.au for assistance or your Academic Liaison Librarian to book a training session. Fill out our online form and attach your reading lists. You will need a current Unikey to access the form. If you don’t have a Unikey, please email your list to library.uos@sydney.edu.au. Mac users may experience errors when using Safari on OSX with this form. Please use Firefox or Google Chrome. If you experience problems, please contact the library. Please send these directly to library.uos@sydney.edu.au clearly identified as it takes a minimum of 6-8 weeks to acquire new material.